And last of all, here's the card back. That thing looks really cool printed. And is perfectly reversible, like my Sailor Moon back. 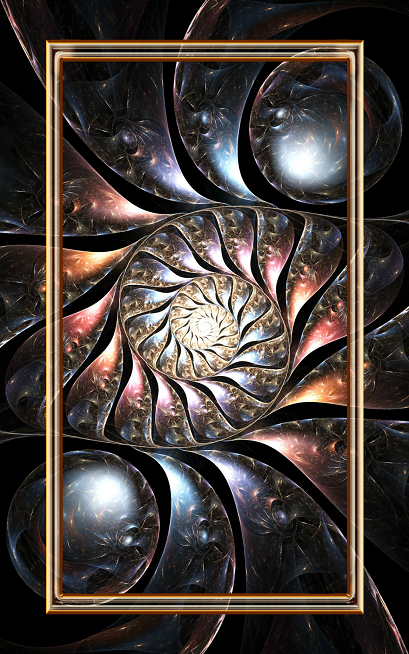 I had some problems making a base for this deck, I made like two other versions, and when I started putting artwork in the frames, I really hated it for some reason. Turned out I needed a more neutral color scheme. One was orange and flame-y, the other was gold and teal and burgundy and it was just a mess. This was perfect. And I don't know if you noticed, but the Roman numerals in the major arcana were done using the same font used for the Final Fantasy logos. It was actually cut from one of the logos. I'd have liked to use a Final Fantasy font for all the card titles too, but I was using free browser based photo editing, so I couldn't really download a custom font to it. I'm very pleased with both my decks. And just so you know, I am doing a Zelda deck. But after how hard it was to match up artwork to each suit's Final Fantasy for this one, there's no theme for the suits. I'm choosing whatever art I feel works best. My only rule is trying to balance out character appearances, and no in game screenshots. I straight up took the card base from another artist that was giving it away for people to make Zelda tarot cards with, although I did make a few modifications. I can't wait to show you the card back I created though, I'm super proud of it. The only hesitation I have is that I'm about to play Wind Waker for the first time, and I feel like I should slow down in case that makes me decide I want to add Wind Waker art to the deck. I don't think I really will, because it was the art style for that game that's kept me from playing it until now. I don't like it. But you never know. I might get really attached to some of the characters, or find some really pretty art. I have a few pieces already, and I haven't even played yet.